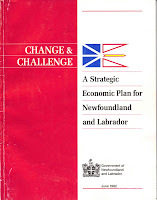 In the fall of 1990, the Government of Newfoundland and Labrador began the process of developing a strategic economic plan for the Province. This planning process involved three phases. During the first phase, government departments and agencies reviewed their activities, assessed the economy's strengths and weaknesses, and identified threats and opportunities within our existing resource industries as well as in our other strategic industries. Further research and analysis concerning various sectors of the economy were undertaken during Phase 2, and a public consultation paper was published to give the people of the Province an opportunity to have a say in the vision, guiding principles and actions that have become the strategic economic plan. The Advisory Council on the Economy (ACE), an independent advisory group comprising representatives from business, labour and other groups, co-ordinated the release of nearly 11,000 copies of the consultation paper, and in the fall of 1991, public consultations were held in 16 locations across the Province. Altogether, the public consultation process resulted in 15 public meetings, 15 meetings for formal presentations, 5 regional round tables, a provincial round table, and the submission of 261 written briefs. Government also held meetings with industry groups, and several submitted reports. A final report on the results of the consultation process was prepared by ACE and published in April 1992. This process provided some sobering insights into the challenges the Province's economy must face and established that there is a broad consensus for change. Most people now realize that government spending is becoming increasingly limited, and that there must be less dependence on government transfers. Most also recognize that working together to establish a competitive economy is the key to strengthening our economic and social fabric. A change within people. There is a need for a renewed sense of pride, self-reliance and entrepreneurship. We must be outward-looking, enterprising and innovative, and to help bring about this change in attitude we will have to be better educated. During the consultation process, most people agreed that education is essential to our economic development. A change within governments. Governments (both politicians and the bureaucracy) must focus on long-term economic development and planning, while still responding to short-term problems and needs. Government programs and services must place a greater emphasis on the quality of the services provided and on the client. Changes in education, taxation and income security systems are also considered critical to our economic development. A change in relationships. To facilitate the necessary changes in the economy, new partnerships must be formed among governments, business, labour, academia and community groups. In particular, better co-ordination between the federal and provincial governments in the delivery of business and economic development programs is needed to eliminate duplication and to prevent confusion for those who use them. The final phase - implementation, monitoring and evaluation -begins with the release of this strategic economic plan. The plan will be monitored and evaluated as it is put into effect, to ensure that it is working and that it is responding to new challenges and opportunities. Throughout this process, Government will continue to encourage public participation and to seek the advice of business, labour, academia, community groups and individuals throughout the Province.